WASHINGTON (FinalCall.com) - In an effort to rein in greedy financial industry corporate practices, the U.S. Senate approved sweeping reforms of Wall Street May 20, ending months of debate over the biggest overhaul of financial regulation since the 1930s. The vote was 59 in favor, 39 against. The vote comes at the same time public concern is increasing about runaway corporate greed. Corporate greed. Billionaires behaving badly, this, even as the U.S. stock market has been in a freefall recently, and the entire Western European economic system is trying to ward off chaos. “Over the last year, the financial industry has repeatedly tried to end this reform with hordes of lobbyists and millions of dollars in ads, and when they couldn't kill it they tried to water it down. ...Today, I think it's fair to say these efforts have failed,” Mr. Obama said after the Senate vote. Mr. Obama supports the bill's tighter rules for banks and capital markets after the 2007-2009 financial crisis that threatened the U.S. economy with near ruin, leading to massive taxpayer bailouts. The Senate bill must be reconciled with the measure approved in December by the House of Representatives. Meanwhile, BP has, in the view of many, consistently underestimated the extent of its oil leak, claiming it was flowing at a rate of 5,000 barrels a day. Some scientists and the U.S. government have questioned that, suggesting that the real figure could be as high as 19 times more than the BP estimate. But the British energy firm maintained its challenge to some of the third-party estimates of how much oil is gushing out of its leaking well on the sea floor as inaccurate and it denied a cover-up. 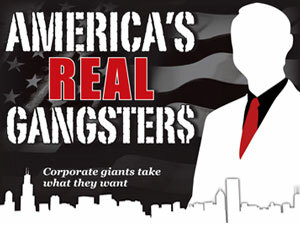 These real-life plots and manipulations of the U.S. economy eclipsed even the wildest Hollywood plots about Wall Street and young, impatient stockbrokers willing to do anything to get to the top, including trading on illegal inside information, while taking part in ruthless and greedy Wall Street piracy by legal corporate raiders. Each real life story today is more shocking than the last. Often they are tragic. A mine blast in a coal-shaft operated by Massey Energy exploded recently, in part because of sloppy safety procedures. In that incident, 29 miners were killed. On top of that, some of the world's biggest, most profitable corporations enjoy far lower tax rates than individual taxpayers, if these giants pay taxes at all, according to Forbes.com. Corporate greed. Billionaires behaving badly. “The most egregious example is General Electric. Last year the conglomerate generated $10.3 billion in pretax income but ended up owing nothing to Uncle Sam. In fact, it recorded a tax benefit of $1.1 billion,” Forbes wrote. In upstate New York, more than 300 full-time manufacturing workers at the Mott's applesauce plant have been attempting to bargain a new contract with the Dr. Pepper Snapple Group Inc. Corporate greed. Despite the plant's most profitable year in the last five fiscal years, the company demanded a long list of concessions: a pay cut followed by a wage freeze. A pension freeze for current workers and pension elimination for future workers. A decrease in employer contributions to the 401K. An increase in employee contributions and co-pays for health care, noted Stuart Appelbaum in a Huffington Post article. The public policy scale in every area is tipped in favor of the corporations. New figures show the number of financial industry lobbyists opposing derivatives market-reform outnumber pro-reform lobbyists by a ratio of 11 to 1. The group Public Citizen says 903 lobbyists have worked to oppose the reform compared to the 79 working for its passage. In all, thousands of lobbyists have descended on Capitol Hill. Big oil, the pharmaceutical industry, the banking and finance industries employ a total of five registered lobbyists for each elected member of Congress. Corporate greed is the “subtext for this whole economic crisis,” according to Dr. Ronald Walters, professor emeritus at the University of Maryland. Corporate greed “is what produced it,” Dr. Walters told The Final Call. “It's a little phrase, but it's a powerful and big idea, because that's what the Congress has been trying to tamp down, trying to regulate, trying to legislate, because the previous Republican administrations simply let the corporate people do whatever in the hell they wanted to do,” Dr. Walters continued. This behavior is “barbaric,” according to Andrew Sheng, chief adviser to the China Banking Regulatory Commission in an article for The Wall Street Journal. He compares Wall Street barons today, to fictional characters in the book Barbarians at the Gate. “Wall Street raiders, aided by investment bankers, acted like Huns breaking down the Great Wall,” Mr. Sheng wrote. In the case of BP, there are now known to have been many acts of negligence and incompetence that contributed to the explosion in the deep waters of the Gulf of Mexico 50 miles off the coast of Louisiana April 20. “We now know that the emergency shutoff valve, supplied by Transocean was leaking hydraulic fluid and its backup had one dead battery out of two. Halliburton (the company that cemented the well) had poured too little cement for the ocean depth so that it broke under pressure and allowed the gas leak to occur,” Mickie Lynn wrote for TransUnion.com. British Petroleum “makes a good study in the ways that corporate greed for short term profits at the expense of people and complex ecosystems can create major catastrophes. First there's BP's safety record and willingness to pay large fines in pursuit of much larger profits over the past several decades,” Ms. Lynn wrote. In the oil industry, don't just single out BP, according to a new report which examines the industry as a whole, in terms of safety and accident records. The international environmental education and resource group Global Exchange has found that operating errors and incidents around the globe are more common than the public likely realizes because most events don't even make the news. “It's beyond the idea that corporate people have no nationality,” or patriotic loyalty said Dr. Walters. “The way they have constructed the capitalist system to work, it is a system that they have put together where they don't lose. If you lose, they still win. That's what the hearings have revealed. “That they have created this system, where they have bet against other people winning, for example the home foreclosure mortgage, that was securitized, they bet against them winning. So they created a system that was not only anti-nationalist, but in some sense, anti-ethical and anti-human. “That's what has to be reigned in. When the human element has to be put back into capitalism, if it can, through regulation and through some sense of ethics,” Dr. Walters said. These financial traders whose greedy and risky conduct with the money of others, is addressed in the financial reform legislation just approved by the Senate, ironically don't manufacture or produce anything of substance in the economy. They literally make money by selling money to those who make things, like furniture, or automobiles.